Knitted and felted details are perfect for winter weddings -- they have such a cozy appeal! If your wedding is approaching, consider a handmade knit or felted ring pillow. The pretty textures on these ring pillows by Etsy seller Lillian's Garden are perfect for a cool weather wedding, don't you think? My favorites are the pillows with snowflakes and the white cable knit pillow with a luxurious velvet ribbon. Which pillows do you love? 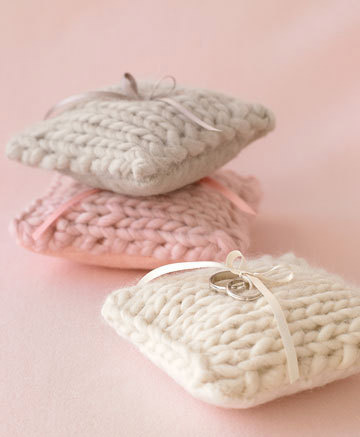 If you are a knitter, you might want to create your own keepsake. 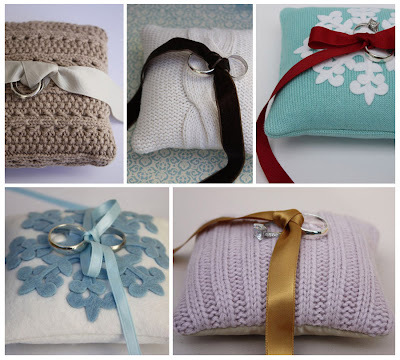 This tutorial for a tiny knit ring pillow will keep your fingers busy!